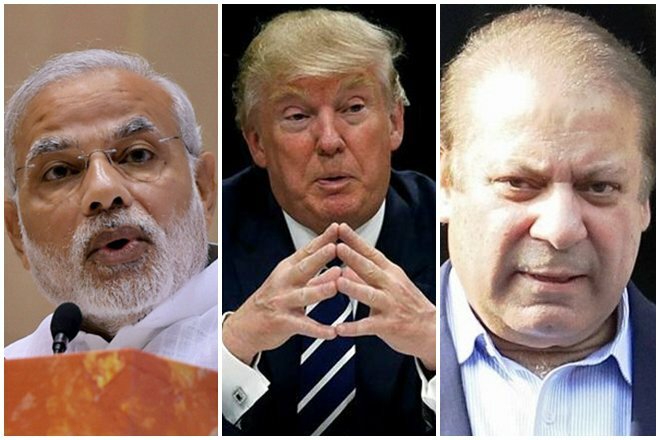 The Indian PM Narendra Narendra Modi, USA President-elect Donald Trump, and Pakistan PM Nawaz Sharif. Much less attention has been given to how Trump would deal with a nuclear South Asia. In the past few weeks, much has been said about how U.S. Grand Strategy could change with respect to Europe, the Middle East, Russia, and China now that Donald Trump will become the next U.S. President in January 2017. Much less attention has been given to how Trump would deal with a nuclear South Asia. From the few statements on the region the President-elect has pronounced during and after his election campaign, it seems that the U.S. will favor India, rather than Pakistan, as an important ally to balance China. And yet, while Trump’s offer to mediate between the two South Asian rivals to promote stability in the region is detached from current U.S. policy, it could actually be a valuable and unexpected asset for Islamabad. Since President Bill Clinton, the importance of India to the White House has been growing with every administration. In the 1990s, faced with an increasingly powerful and assertive China in the Asia-Pacific, Washington started to look at India as its natural ally to contain Beijing. Thus, when in 1999, nuclear rivals India and Pakistan went to war in Kargil, President Clinton pressured Pakistani Prime Minister Nawaz Sharif to withdraw his troops from India-controlled areas. The same script was repeated in late 2001 when, following a dreadful attack on the Indian Parliament by a Pakistan-based terrorist group, India initiated its largest military mobilization against Pakistan that pushed both countries to the brink of war. Like his predecessor, President George W. Bush pressured Pakistan to step back. In 2000, writing in Foreign Affairs the then US Secretary of State-in-waiting Condoleezza Rice observed, “there is a strong tendency conceptually to link India with Pakistan and to think only of Kashmir or the nuclear competition between the two states. But India is an element in China’s calculation, and it should be in America’s too. India is not a great power yet, but it has the potential to emerge as one”. The Bush administration understood that improving bilateral relations with India would help enhance its ability to counter China’s rising power in Asia. In 2006, Bush and India’s Prime Minister Manmohan Singh announced the U.S.-India Civil Nuclear Cooperation Initiative, which allowed India to receive civilian nuclear assistance without being a member of the Nuclear Test Ban Treaty (TBT). The U.S.-India civil nuclear agreement came into force in 2008, during the last year of the Bush presidency. As Barack Obama stepped into the Oval Office in 2009, he confirmed his support to the agreement and declared India to be an indispensable U.S. partner. Moreover, visiting the Indian Parliament in 2015, he reiterated the U.S.’ support of India’s candidacy for a permanent seat at the UN Security Council. While U.S.-India relations under Obama improved, conversely, relations between the U.S. and Pakistan reached a new low. In 2011, the U.S. secretly went ahead with a military plan using the U.S. Special Forces to kill Osama bin Laden in Abbottabad without the knowledge of Pakistani authorities. Although this constituted a violation of sovereignty under international law, it signalled that the U.S. did not trust the Pakistani government with sensitive information; incidentally, Osama bin Laden was killed next to Pakistan Military Academy. Further, funding cuts by the Congress towards Pakistan followed, and the hundreds of Pakistani civilians that have been killed by American counterterrorism drone strikes in the “Af-Pak” theatre of operations did not help boost confidence between the two Cold War allies. Bilateral affairs continue to be strained between the U.S. and Pakistan; the Obama administration maintained silence on the dispute between Pakistan and India over Kashmir. This further ruffled feathers in Pakistan and reinforced U.S. sympathy towards the Indian cause. In fact, in both 1999 (Kargil War) and 2001-2002 (Twin Peak Crisis), Pakistan exploited fears of a nuclear escalation in South Asia to draw the U.S. in as a third-party to help extract concessions from India. Pakistan’s strategy nevertheless backfired, and without a third-party support, a conventionally stronger India is unlikely to accept Pakistan’s terms. Trump’s offer to mediate between the two countries has been warmly welcomed by Pakistan but understandably less so by India. However, it is undeniable that the U.S. and India will continue to strengthen bilateral relations. During the presidential campaign, Trump remarked that if elected, India and the U.S. “will become even better friends, in fact…we are going to be best friends”. By contrast, Trump admitted to Pakistan being “the most dangerous country in the world”. While many believe that Trump will sober up his campaign rhetoric and forget many of his most controversial and outrageous ideas, statements such as “India’s check of Pakistan” and his strong statements regarding restricting Muslims from certain countries to enter the U.S. certainly bodes ill for Islamabad. Nonetheless, Trump’s delusions of leadership and confidence in his own ability as a negotiator could be an unexpected gift to Islamabad which will seek to make sure Kashmir is high on the agenda of the next American President. As of now, in a recent phone call, Sharif got Trump to say that he “would love to visit Pakistan“. The last American President who visited Pakistan was Bush in 2006. Jonata Anicetti holds a M.A. in Intelligence & International Security (KCL) and one in International Relations and European Studies (Cesare Alfieri).